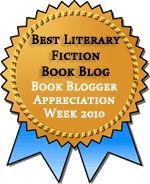 All of this is to say that when The Spare Room by Australian author Helen Garner was being praised all over the blogosphere two years ago, I tuned out a lot of the praise. But it was so persistent and came from so many bloggers whose taste I trust that I couldn’t tune it out completely. So when LibraryThing offered a copy of the new paperback edition through its Early Reviewers program, I decided put my name in for it. It turns out that their reviewer-selection algorithm thought this book was a good fit, and now that I’ve read it, so do I. 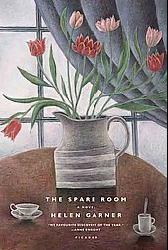 The Spare Room is a short novel, only 175 pages long, detailing three weeks in the life of a cancer patient, Nicola, and her friend Helen, who has agreed to put her up in while she’s away from her Sydney home to seek an alternative cancer treatment in Melbourne. Helen, the first-person narrator, is practical and realistic about Nicola’s situation. She believes Nicola is going to die, and that the best thing she can do is accept it and prepare herself. Nicola, on the other hand, is idealistic and optimistic; she’s sure that with the right therapy—in this case, injections of vitamin C, hours in an ozone sauna, and organic coffee enemas—she’ll be completely cured. The two women’s difference in outlook generates most of the tension in the novel, more even than Nicola’s approaching death. When Helen must change Nicola’s sheets several times during the night because the alternative treatments are causing pain and night sweats and because Nicola is suspicious of strong pain-killers, this tension is always in the background. But the novel is about more than alternative medicine and how we respond to incipient death. There are questions of how much we can ask of friends—as opposed to family. Who can we ask to do the hard things, and how much is too much to ask? And then there are questions of how far we’re willing to let friends go down wrong-headed paths before we speak up, and what do we do when they don’t listen? These are weighty questions, and Garner does not provide easy answers. She just shows how these two women navigated this difficult passage, sometimes clumsily and sometimes with great grace. There are moments that are tremendously moving, but they are moving in their subtlety, not in overwhelming sentimentality. The story, incidentally, is loosely based on Garner’s own experience caring for a friend with cancer. According to this interview at dovegreyreader scribbles, she started writing it as a memoir but realized that making it a novel would give her more freedom, although the emotional and psychological truth of the experience does, I think, shine through. What’s interesting is that even though Helen in the novel is a fictionalized version of the author, Garner doesn’t give her fictionalized counterpart a break or craft the story to make her into a sainted caregiver. She’s angry and frustrated with Nicola’s choices, sometimes rightfully so, but there’s a sense that she’s mostly frustrated that Nicola isn’t acting according to her own rules, which includes being realistic and properly grateful. Nicola’s flippant attitude minimizes not only her own desperate situation, but also the value of Helen’s sacrifices for her friend. I’m sure that the grimness of this book will be too much for some. Garner writes of Nicola’s treatments and her symptoms in more detail than many readers would want, but I never found it gratuitous or voyeuristic; the details are important to showing how unpleasant, and intimate, this situation is for both women. And the book isn’t unrelentingly grim. There are moments of levity, and times when I wanted to stand up and cheer. It’s what, in my mind, a cancer narrative ought to be. It’s raw, honest, beautifully written, and never sentimental. I don’t know that I would have chosen this book based on the premise, but your review has made it sound like something I’d enjoy. Kelly: I’ve had extraordinarily good luck w/ the ER program. Only one book that I didn’t like much, and lots of fabulous ones that I loved. Their algorithm understands my taste. Thanks for the great review. I read the hardcover when it was first released and thought it was well written. diane: Yes, the writing here is excellent. Sarah: I was wondering about the rest of Garner’s work. My library only has The Children’s Bach, so that’ll probably be my next Garner, but I’ll put Joe Cinque’s Consolation on my wishlist as well. And thanks for the interview link. I’ll take a look at that right away. Since the only cancer narrative I’ve been able to bear to read (and/or watch) is Margaret Edson’s stunning Wit, this sounds like it’s up the same alley. You have seen that, haven’t you? It tore chunks out of me to watch it, but it’s unmissable. The filmed version stars Emma Thompson. Nice review, Teresa. This sounds good. Jenny: I loved Wit (I’ve seen the film)–it was so good on so many levels, and this book did bring it to mind. I didn’t find this book quite as devastating, but I think that’s because I identified so strongly with the main character in Wit, not because this isn’t as well done. I have this and I have yet to read it – and I’m not sure that I can. The cancer narrative is always the one I can’t bear because it spawns this huge blanket of meanings, and few authors can approach that without emotional manipulation. I can’t bring myself to read about people suffering horrible treatments who are going to die – I want to think when reading, not dissolve into a puddle of misery at the cruelty of the world. But I have heard this is a very good book! litlove: Yes, the emotional manipulation of so many cancer narratives bothers me, but I didn’t find this to be manipulative at all. And it does have a bit of hope about it. I found the ending oddly inspirational. I have this waiting patiently on my TBR pile and now can’t wait to read it. What a beautiful review. Reading about cancer is never going to be a particularly pleasant experience but I do think it’s important to sometimes leave your comfort zone and let yourself be made uncomfortable. Life is not all a bed of roses. My recent reading of Richard Yates has made me far more open to non comfort reading, I must say. bookssnob: Yes, this is uncomfortable, but a good kind of uncomfortable. I think you’d like it. As much as you love Yates, the dark aspects won’t be a problem. I think I’ve heard of this before, and avoided it for much the same reason as you. I don’t think I’ve read any books in which cancer was the driving force of the narrative, apart from My Sister’s Keeper (embarrassing confession). But maybe I should give this a try. Jenny: Oh, My Sister’s Keeper–I’d blocked that out (manipulative cheater of a book with a cop-out ending…grumble, grumble). This is NOT My Sister’s Keeper. As a cancer survivor and also caretaker (who has also read this book and many others with cancer itself as a main character) it’s interesting to see that people deliberatly avoid the topic – understandably so, in this culture of health-as-religion and while most people would write cancer with the big “C”. I read this book a month ago and liked it for its honesty in recognizing that people have their own agendas about someone else’s choices and the more desperate the situation, the more emotionally loaded those agendas become. But then, I’m not looking for the patient to live and die heroically, and I don’t think of cancer in terms of battles “lost” when you die from it. There are non fiction works regarding what it’s like to be a non-related caretaker, so I did not feel this added to my understanding, but it probably would to a less personally involved reader. Kathe: Thanks so much for sharing your perspective. I was wondering how this book would come across to a cancer survivor or caregiver. And you’ve touched on an aspect of my discomfort with a lot of the cancer-related books I’ve heard about–there seems to be this insistence on heroism that I’m not sure is an honest reflection of a lot of people’s experience. This sounds like a touching read but one I will have to wait for the right moment to pick up. Kathleen: Yes, this is a book that you’d have to be in the right frame of mind for.